If you want to see Mumbai from a different perspective, one of the most memorable things you can do is go on a Mumbai boat trip. If you're on a budget, taking the ferry to the Elephanta Caves or Alibaug are options. However, if you don't mind splurging, you can charter a luxury yacht and determine your own itinerary. Both day and overnight trips are possible, as well as sunset trips around the coast of Mumbai. The season starts in October and ends in May. Boating operations are suspended during the monsoon, from June until the end of September. Fortunately for me, one of my friends decided to charter a boat for his birthday. It was an attractive and immaculately clean little yacht that had space for up to 10 people. Inside was room to sleep, a toilet and basin, and other facilities such as a stereo. We were picked up from the Gateway of India late in the morning and headed to Alibaug for a picnic lunch at tucked away Awas Beach. We brought our own food and wine, and had a blissful day away from the hustle of the city. In the afternoon, we cruised around Mumbai Harbor as the sun set, and docked back at the Gateway of India in time to relax on the boat and watch the Gateway and the Taj Palace hotel become illuminated in the evening. It was one of the most magical experiences I've had in Mumbai. Marine Drive and the Mumbai skyline (also beautiful at night, with the chain of lights glittering like their name "the Queen's necklace"). Northern beaches such as Madh Island and Gorai. Fishing in the open waters towards the west. 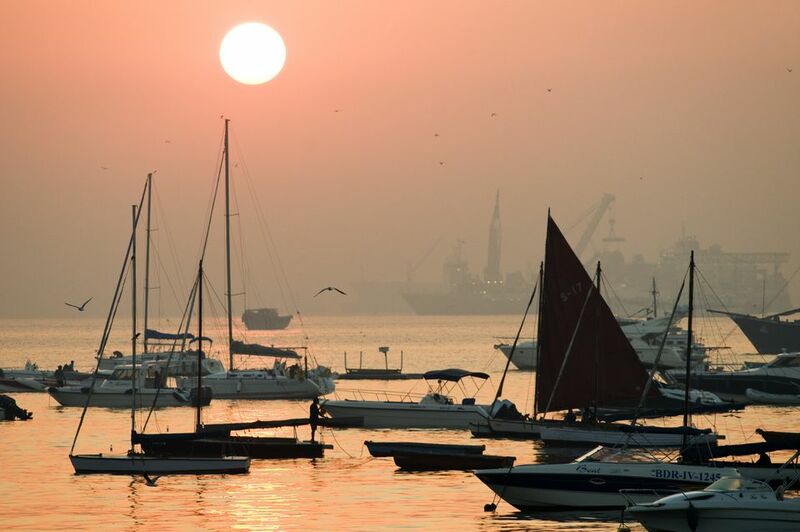 An evening cruise, dinner, and overnight in Mumbai Harbor. A day on board the yacht. A day of water sports at Mandwa beach near Alibaug. A weekend trip with beach hopping around Alibaug. Photography along the Konkan coastline. The first thing you should decide on is the type of experience you wish to have -- are you looking for a boat that's built for speed (a motor boat) or leisure (a sail boat)? You'll need to take into account the sailing capabilities of yourself and your crew. It's harder to maneuver longer yachts, so the destination will also play a big role in the size of the yacht you hire. In addition, it's necessary to consider the number of people that will be aboard, and the services you require. Do you want food and beverages to be provided, or will you bring your own? Most yachts are hired on an hourly basis. Rates start from about 5,000 rupees for two hours, for a small boat that can fit four to six people. Larger groups of eight to 10 people can expect to pay around 10,000 rupees for two hours, going up to 15,000 rupees for boats that can accommodate 15 people. It's a good idea to contact a few companies and compare prices and offerings. Boat Booking India is one of the most popular ones. They have a wide fleet of motor and sail boats, as well as party boats. Yacht Tours Mumbai is also popular. They offers a variety of packages such as beach picnics, sunset cruises, day cruises, harbor cruises, dinner cruises, and a luxury yacht holiday tour to Goa. Other reputable companies include Yacht Charters India, Blue Bay Marine, West Coast Marine, and Ocean Blue. A couple of businesses, such as BookMyCharters.com and Accretion Aviation, are now also providing aggregator services with competitive rates. UberBOAT -- priced at 5,700 rupees one way, for six to eight passengers. UberBOAT XL -- larger speedboats that can accommodate more than 10 passengers and cost 9,500 rupees one way. The service operates between 8 a.m. to 5 p.m. Bookings need to be made at least 15 minutes in advance. Travel time from Mumbai to Alibaug by speedboat is about 20 minutes.